John Kinyon lives in rural Warren County approximately four miles south of Roseville, behind the Stice Cemetery, with his wife, Marcy (Rogers) and their daughter, April. John and Marcy first knew each other as childhood sweethearts-meeting at a summer Bible camp. And following the passing of their mates, they married in September of 2013 at the summer camp where they had first met so many years earlier, outside of Brighton, Iowa. Their cherished friend, Roger McMurry-camp director of their earlier encounter spoke at the occasion. 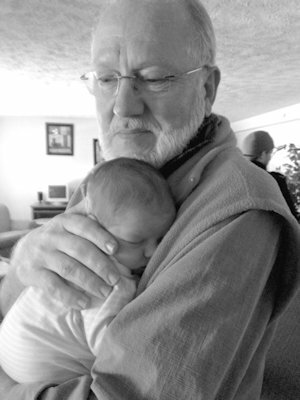 John was born at Mount Pleasant, Iowa in 1954 and was raised with his brother, Steve and sister, Pam in southeastern Iowa until moving with his family to Mason City, IA where his father entered the ministry, serving at a local church there. Eight years later his father Donald Kinyon, continued his ministry in Muscatine, IA for the next 23 years. His father now resides at home in northeastern Iowa at Guttenberg with John's sister. His mother passed away last February. John's brother Steve, lives in Muscatine, IA, with his wife Laura. After graduating from high school at Muscatine, IA, in 1972, John continued his education at York College in York, Nebraska. The following fall John married Cheryl Imhoff, an Iowa farm girl that he had met from Osceola, IA the summer before. They spent most of their lives together in the Muscatine, IA area raising their three children David, Alex, and Martha. David lives in Topeka, Kansas with his wife, Mandy, and their daughters Cheryl (4) and Wendy (3 weeks). A son, Ian (8), from a prior marriage lives outside of Springdale, Arkansas. David is currently working at Red Lobster, and Mandy is a mortician. Alex lives in Omaha, Nebraska with his wife Maureen and son, Harrison (11 months). Alex and Maureen are house-parents at Boy's Town. Martha and husband Ben, live in Okinawa, Japan, where Ben is currently stationed with the United States Air Force. Ben is scheduled to be deployed to Afghanistan this spring. And upon his marriage to "Marcy," John also gained the joint pleasure of inheriting four more children and nine more grandchildren. John entered the profession of Quality Assurance in Muscatine, IA and later worked at The Rock Island Arsenal. There, he worked as an inspector and in several assessment projects, and spent his last six years in Precision Calibration and Metrology. Following his twelve years at the arsenal, John decided to finish his degree in Elementary Education at the University of Iowa. After teaching in Iowa for three years he moved to Springdale, Arkansas where he taught elementary for seven more. He left the classroom four years ago for health reasons. John enjoys hunting, golfing, rock hounding, exploration, and any other activity that takes him face to face with nature and the outdoors. John also takes great pleasure in taking a thought and bringing it to life somewhere between lines and spaces. He began his writing career during a creative writing course that he had at the university. One evening, as he sat down to attempt a writing assignment, he gave birth to Amos-an amazing little leprechaun who lives between the pages in his storybook, "The Changing Colors of Amos." John was the guest author at "The Quill" during the Stronghurst Christmas Walk. He autographed books and entertained with many stories and poems that he has spun. God puts these stories and thoughts that John writes in his head, John said, and he simply lets them out, giving credit where credit is due. John's motto for living is "God takes full responsibility for a life totally yielded to him."